Sign up for Broadjam today to follow Retta Guest Choate, and be notified when they upload new stuff or update their news! Where it?s peaceful to be alive. No grand Central Station at quarter to five. Seasons come and they go. To make angels in lying on my back. Snow and wind soaking through my slacks. It?s living in nature and loving it. Dirt roads, cows on the farm. Downeast accents, Marjorie Standish and charm. Lakes and fields only discovered by me. Wire fences quiet and red maple trees. With his modular homes, an a billion garbage cans. Salt air, rocks and the surf. It?s a feeling that gets under your skin. It?s only found deep within you soul. Mt. Blue stretching up to the sky. Lovely, peaceful, like I hope to be. Thanks for supporting Retta Guest Choate! 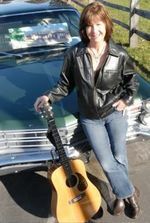 Would you like to help Retta Guest Choate get heard by industry pros by buying them a song submission credit to Broadjam Music Licensing Opportunities?